The very first thing you may want to do is check if you run a 32-bit or 64-bit version of the email client. Open Thunderbird if it is not open already. Select Help > About Thunderbird. The page lists the version of the client and whether it is 32-bit or 64-bit. You need to be aware of a couple of important things before you migrate. First, that 64-bit versions are not officially supported at this point in time. While that does not mean that 64-bit applications won't run just as good as 32-bit versions of Thunderbird, you may run into issues that are exclusive to the 64-bit version. Second, that 64-bit versions of Thunderbird may perform worse than 32-bit versions under certain circumstances. Systems with a low amount of RAM, weak processors, and older computer systems need to be mentioned specifically. 64-bit applications may provide benefits: better RAM utilization which is great if your email databases are large, and you may even see speed improvements and get security improvements out of it as well. The process of migrating a 32-bit installation of Thunderbird to 64-bit on Windows is straightforward. All you have to do is download the 64-bit installer, run it, and Thunderbird will do the rest. Since you are installing a version that is not supported officially, you may want to back up the Thunderbird data folder or even the entire system partition before you start the process. You can also use MailStore Home to backup all mails locally. Close all instances of Thunderbird. 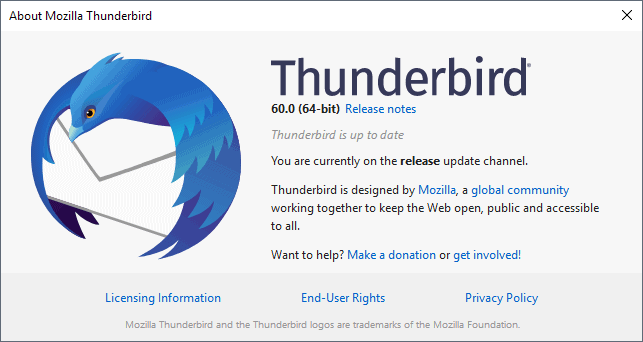 Head over to the official Mozilla FTP site and download the 64-bit version of Thunderbird for your locale from there. Select the most recent version, then win64, and then the locale to open the download folder. Click on the download link to download the 64-bit version of Thunderbird to the local system. The installer does not reveal to you that you are installing the 64-bit version of Thunderbird. You could select custom installation at one point to install it to a different directory than the 32-bit version so that you could go back to the 32-bit version without installing it anew. Note though that both installations will use the same user data. Thunderbird should start up normally and you can check that you are running the 64-bit version now by selecting Help > About Thunderbird. Go back to the 32-bit version if you notice any issues afterward. I don't have scientific proof but it seems to me that the 64-bit version of Thunderbird is more responsive than the 32-bit one on my system with a good number of emails in the database (120k). Folder switching seems a lot faster and folders display emails more quickly to before. The guide explains how Windows users can migrate from a 32-bit installation of the email client to the 64-bit version of it on Windows PCs. Thks for the article but I would have said : uninstall thee 32 bits edition first keeping the data ! Yeah. Definitely uninstall the 32 bit edition first, (while keeping the data). How do you correctly save the data? Seems to be lot of conflicting info on google. Considering how slowly Thunderbird add-ons get updated, it might be smart to wait for a few months. Add-ons are independent of architecture and work identically on 32Bit and 64Bit versions of Thunderbird (respectively Firefox). I performed a clean install of Thunderbird 60.0 64-BIT. I don’t run plugins (only add-ons/extensions) but otherwise be it reminded that as with Firefox 64-BIT, 32-BIT plug-ins won’t be operational on a 64-BIT build application. No data issue given 32/64-BIT installations will use the same user data as mentioned in the article. TB60 seems snappier, start delay is undoubtedly faster than TB52 but I don’t know what is explained by the code and what is by the architecture (32/64 BIT). Why did I choose 64-BIT? I guess it echoes improvement in my mind, though the article leverages this a-priori. How about updating the portable version Martin? Is it available? There is no official portable version and the one from Portable Apps appears to be 32-bit at this point. yes, it installs in \program files\, the 32 bit version is in \program files (x86)\. It is possible to have the 32 bit- and the 64 bit Version installed on one system since account information is accessed from the independent “User” folder from Windows. The 64 bit version works but most of my extension won’t work with it. The compatibility workaround activates them but they won’t come to function at all. The start delay of the application is a little fewer but still noticable. I tried TB 60.4 (64-bit) and deleted the 32-bit version. Everything works well but TB is no longer recognized as standard mail program from Acrobat Reader or Microsoft Word. How can I solve this problem? ‘Always check to see if Thunderbird is the default mail client on startup’ / ‘Check now’ ? wow. I had been using tb since netscape days, and for quite some years I have been searching for a 64 bit version, after I switched to 64 bit windows. Thanks to you for giving direct download link of it. I am downloading and installing. Hope all my 3-4 addons work in 64 bit.